There were no social security payments or grants in those days, with very little relief from poverty from anyone but the "charitable". Air rifle shooters were certainly that. Birmingham Hospital's Charity Cup. Amongst the many charities that benefited at these early times from the activities of bell target shooters, was the "Birmingham Daily Mail" fund for the support of the wives and families of the reservists and troops of the Boer War and World War 1. Furthermore they raised a great deal of money for the "Mail Christmas Tree Fund" in aid of the hundreds of children in the local hospitals. 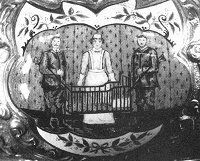 The Birmingham Hospital Charity Trophy is still shot for to this day, and on the front of this magnificent object is a coloured Bilston enamel showing a long-skirted nurse standing by high sided child's cot with two shooters standing near. Several of these early day pubs have left a record of their charity work at the time: The Brown Lion, Lodge Road, Birmingham, who won the 1902-1903 League Championship Shield of Birmingham; The Wolverhampton Airgun League of 1905-1906; and the Horse and Jockey, Bordesly Park Road, Birmingham who collected £50 (probably £5000 today) in a few weeks in 1905 to provide toys and other little necessities to enable the poor, suffering children to obtain some little enjoyment during the festive season. Close-up of the Bilston enamel on the front of the cup. This is not just pure sentiment. Perhaps it should be borne in mind that it was nothing unusual to see children barefoot in the streets of Birmingham and the Black Country. The Boot Fund did not reach everyone. Hundreds of air rifle clubs annually assisted in the same good work, some, voting part of their club funds, some making daily collections amongst their members and friends, some arranging a friendly shooting match and some a smoking concert at which a public celebrity occupied the chair. At these functions, another form of fund raising took place. This took the form of throwing coins to the ceiling, on which they stuck by means of a tack and a piece of cork placed with the coin in a piece of coloured tissue paper. Many of the sick and helpless children of the Midlands in the Hospitals and Cottage Homes (or "Spikes" as they were sometimes called) had the airgun clubs to thank for their little extras at Christmas. It cannot be emphasised enough how valuable this fund raising was at the time. Charity Hospitals were the norm and one could count oneself very lucky to even get into one for constant attention. Most of the poor had to depend on neighbours or family in times of need, when rabbit stew or chicken broth were saved for a sick neighbour or elderly person. 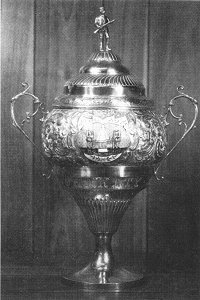 The fundamental principle on which most of the clubs were formed and based was fund raising, and the very nature of the people who took part, their financial circumstances at the bottom of the social ladder, in pubs within close proximity to the seat of the need, made the sport not only enjoyable to the competitor but also accomplishing charity fund raising that had never been so successful before. Publicans must also come in for some praise here, for putting their club rooms at the disposal of the airgun shooters.